According to MedicineNet.com, vitamin E is an important nutrient for human health. It is an antioxidant, which means that it can help repair or prevent damage to cells from free radicals - chemicals or substances that attack healthy cells in the body. Vitamin E is often taken orally in the form of capsules, though it is also added to skin care products for topical use. Vitamin E is also a potent moisturizer and has been reputed to aid in the healing of scar tissue. Due to its high moisture content, the question of whether or not vitamin E can clog pores has come up in the skin care industry. CareFair.com indicates that Vitamin E is a fat-soluble vitamin, which means that the skin not only readily absorbs it but holds it for longer than it may hold a water-soluble moisturizer. This is where Vitamin E does have the potential to clog skin. Since the skin retains the moisture, overuse of vitamin E--particularly for those with oily skin--can lead to clogged pores. However, AcneTalks.com recommends coconut oil--which contains Vitamin E--in small increments to help oily or acne-prone skin. One of the keys, then, appears to be moderation. An article published in the November 2001 Issue of Nutrition Science News has shown that there is a significant difference in the bodily absorption of synthetic forms of Vitamin E as opposed to natural forms. This holds true for taking supplements orally as well as topical application. The likelihood of Vitamin E causing clogged pores may also hinge on the quality and the source of the supplement. There is actually a different molecular structure between the two, and that structure indicates how the body will use the molecules. Vitamin E that is not in a form readily recognized by the body is likely, then, to be less beneficial--if not harmful. Vitamin E does repair damaged skin in and of itself, though its optimal use is with Vitamin C. The two vitamins complement each other in their absorption and the tasks they complete within the skin. It makes sense, then, that too much of one over the other might throw off the balance of the skin. 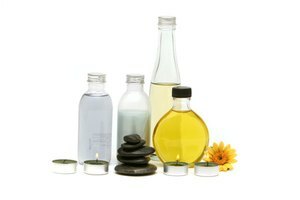 AcneTalks.com points out that one of the skin's reactions to unbalance is to produce excess sebum, or oil. 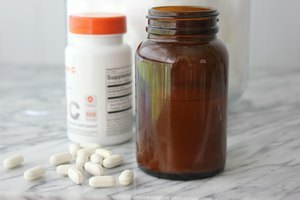 According to AcneTalks.com, coconut oil contains many nutrients, among which is Vitamin E. Also included in the mix, though, are Capric and Lauric Acid. These two acids help to destroy the bacteria that cause acne and exacerbate clogged pores. Additionally, acids help to exfoliate dead skin, which is one of many another pore-clogging agents. These two factors pave the way for Vitamin E to be much more readily absorbed by the skin without clogging it. Vitamin E is a healthful nutrient that is very important to skin care as well as to many other bodily systems. When high-quality natural Vitamin E is used in the proper amounts, particularly in settings that make its absorption easier, it should not clog pores. Persons with oily skin, however, may want to use topical Vitamin E in more limited quantities. If Vitamin E is dispersed in carrier oils, make sure the oils are lightweight, non pore-clogging oils. The other ingredients may have more potential to clog pores than the Vitamin E itself.